Notes: Whether or not he can talk has been debated among fans especially since he once spoke in the world’s collide storyline. When a member of the D’masi police force chased an intergalactic criminal to earth. An African-American man stepped in between her and certain death resulting with him mortally wounded. Grateful to the lower life form for his sacrifice she used her people’s advanced technology to heal him and in the process unlocked his full potential and enhanced him. After this she left earth promising to return for him one day (Dwayne McDuffie, Delphi Forum). 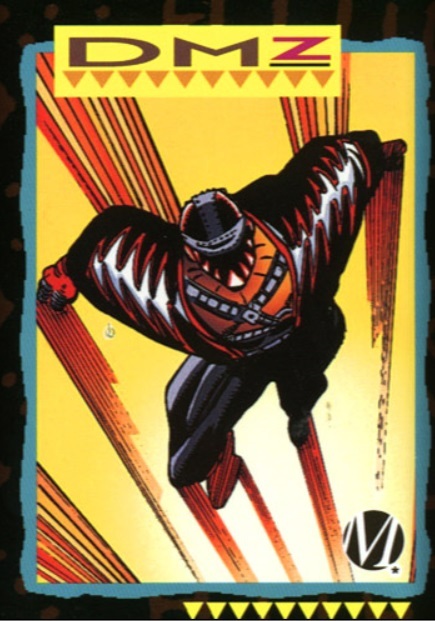 After the Big Bang event he became the most mysterious member of the super human team the Blood Syndicate. He always showed up when needed though he comes and goes as he pleases. DMZ often spends his time atop the ruined tenth avenue bride, whirling an enormous beacon mounted on a massive chain (Milestone Skybox card #90, 1993). One thing I’ve always wanted know was how exactly did he hooked up with the Blood Syndicate?